The deal gives SoftBank Vision a 19.6 percent stake in GM Cruise, which includes Cruise and Strobe Inc., a lidar company GM acquired in October. DETROIT -- SoftBank Vision Fund, a prominent technology investment firm, is investing $2.25 billion in Cruise Automation, General Motors' autonomous vehicle operation. The investment, GM said Thursday, will provide financial backing for the automaker’s plan to begin launching self-driving vehicles on a volume basis in 2019. The deal will give SoftBank Vision a 19.6-percent stake in GM Cruise, which includes Cruise and Strobe Inc., a lidar company GM acquired in October. The investment values the two operations at $11.5 billion. GM President Dan Ammann said the valuation “recognizes” the progress the company has made in autonomous vehicles over the last two years. Ammann, during a call with investors Thursday, said the automaker was “on a path” to fully fund the operations and “wasn’t looking for a partner” but through discussions over the last several months decided the tie-up was the best decision. As part of the deal, GM will also invest $1.1 billion in GM Cruise upon closing of the transaction, which is expected by the end of June. GM’s investment includes some of the automaker’s previously announced plan to invest $1.1 billion in autonomous vehicles in 2018. GM says it has already invested upward of $500 million in the technology so far this year. The investment from SoftBank Vision will be made in two installments. At the close of the transaction, the Vision Fund will make a first outlay of $900 million. 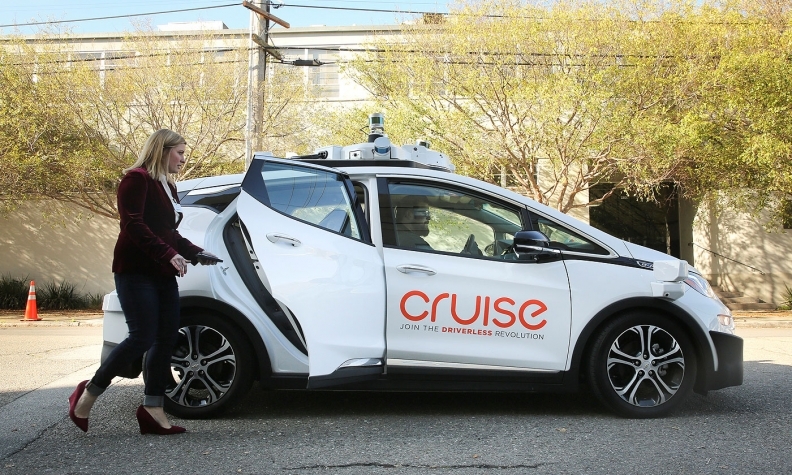 At the time that Cruise AVs are ready for commercial deployment, the Vision Fund will complete the second investment of $1.35 billion, subject to regulatory approval. SoftBank Vision, which has substantial investments in other mobility providers, such as chipmaker Nvidia and ride-hailing giant Uber, is a part of SoftBank Group, a global conglomerate holding company based in Tokyo. “We’re just really excited to be partnering with SoftBank to bring this vision to life,” said Ammann. The deal opens GM to a “unique set of relations” and additional options for commercialization of self-driving vehicles, he said. Michael Ronen, managing partner of SoftBank Investment Advisers, said the company has been monitoring the autonomous vehicle space for several years. He said the firm decided to invest in GM and Cruise “for several reasons,” including the automaker’s capability to quickly manufacture the vehicles at scale and “seamless partnership” between the Detroit automaker and San Francisco-based Cruise. Seven years into the deal, SoftBank can exchange its stake in GM Cruise for liquidity or GM can seek to have the company transfer its interest into GM shares. SoftBank Vision also will receive one of six director seats for GM Cruise, which GM will begin reporting as a separate segment when reporting its earnings. The deal and separate reporting could be a foundation for GM to eventually spin off the autonomous vehicle operations, which some analysts have speculated could be valued as much as $30 billion. Ammann and Barra said the company is focused on safely developing and deploying the self-driving vehicles and declined to directly comment on the possibility of GM Cruise becoming a standalone operation. “As we move forward, we’re going to evaluate opportunities,” Barra told investors, adding GM will do what’s in the best interest of its shareholders. GM, which has touted having all operations under one roof, acquired Cruise in March 2016. Since then, GM has grown to be considered a leader in the development and deployment of self-driving vehicles along with Google spinoff Waymo. It is predominately testing the self-driving cars in San Francisco as well as Arizona and Michigan. GM previously said testing is expected to expand to New York in 2018. GM executives on Thursday declined to provide additional details regarding where and when it plans to launch the fleets in 2019. The automaker is producing the self-driving cars at its Orion Assembly plant in suburban Detroit. It is the only mass-production facility to manufacture such vehicles. Cruise, from Dec. 1, 2016, to Nov. 30, 2017, drove 131,676 miles on San Francisco’s city streets in 94 Cruise AV cars, which are based on the Chevrolet Bolt EV.